A few weeks ago, we asked you to name the worst airport in America. It was a seemingly crowded field, but in the end, there was no competition: LaGuardia won out by a landslide. And not just according to you—that's according to experts, the governor, and even Joe Biden. Jim Venturi, a filmmaker and the child of the legendary architects and planners Denise Scott Brown and Robert Venturi, wants to fix it. Now, mind you, Venturi isn't an urban planner. But he does have a plan—one that borrows from sources as disparate as early email protocols to Robert Moses himself. Profiled recently in The New York Times, Venturi describes his idea as similar in scale to Moses' transformative projects in the 1950s, but different in a very crucial way: He doesn't want to make more roads, like Moses did. He wants to make better transit. I called up Venturi after reading his comments in the NYT, curious about how, after staying above the fray of his parents' world until his mid-40s, he got interested in solving one of New York's unsolvable problems. First, a bit about his idea. He calls it Rethink NYC, and it's a multi-pronged, multi-decade concept that would connect some of the city's disparate transit systems. The idea, he writes, is "to do for pedestrians and mass transit in the 21st century, what Robert Moses did for the automobile in the twentieth." But it begins with LaGuardia. Venturi wants to move Rikers, and its 11,300-odd inhabitants, to prisons elsewhere in the New York area. "The Rikers Island Correctional Facility is an embarrassment," he explains in his proposal. "The conditions are criminally inhumane." After moving inmates to modernized facilities, Venturi wants to take the 413-acre island on which Rikers sits and turn it into a new LaGuardia Airport, infilling the slip of water that separates it from the airport today and creating four new, longer runways to replace its current two. 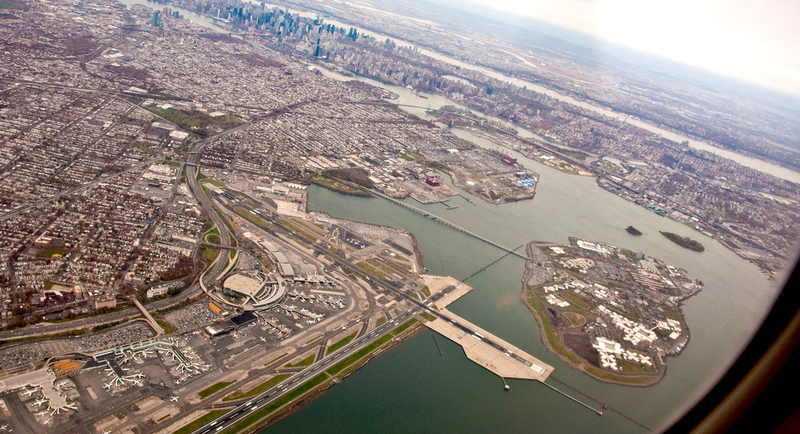 "The main capacity problem that the present LGA faces is that its two runways are only 7,000 feet long," the Rethink team writes. "By contrast, Newark has three that are: 11,000' 10,000' and 6,800' in length. JFK has four: 14,572', 11,351', 10,000' and 8,400'." This rail station is a critical crux of the plan: A 22-track wonder that would include new connections to the A Train and New Jersey Transit and Amtrak, but also to Metro-North lines and the Long Island Rail Road. And nestled amongst these grand plans for new transit systems are opportunities for development: Venturi envisions the new Port Morris station embedded below a huge convention center to replace Javits with 2.7 million square feet of space. But while Venturi's transit proposal feels like connective tissue that will take decades—if not centuries—to build, his plan for LaGuardia itself is the real core of the project. Governor Cuomo's new design competition to improve the state of the terminals only goes skin deep, he says. What LGA needs is a bedrock-deep redesign, focusing on doubling the number of runways and turning the airport into a hub into which nearly all of the Northeast corridor's transit lines feed. Venturi grew up interesting in computers—despite the celebrity status of his parents in the architecture world, he was more interested in technology, attending early hacker conferences hosted by 2600 Magazine as a teen and eventually working in IT himself. Over the past few years, though, that's changed. "Now, technology feels more mature, and urban planning seems like tomorrow's industry," he says. Transit networks, after all, are not that different from digital networks. "For example, where do the fiber optic cables go?," he says. "Under rail lines. So [data] packets and trains have been routed together forever." Upon closer inspection, his ideas for New York are actually closely tied to his work in the early days of internet. He describes an early job connecting email clients, migrating legacy systems towards Microsoft Exchange, as a metaphor for connecting historically distinct train lines in New York. "Those skills are what I bring to this project," he says. "We're taking two legacy systems and unifying them." Also in the works, he tells me, are plans for updating JFK and Newark. Can the deep-seeded, unthinkably complex problems of the largest city in America be solved by a single person? It's unlikely—and Venturi is well aware that his plan falls far beyond the bounds of what a typical urban planner might consider plausible, which he credits to the fact that he grew up in the future-minded tech world, not the planning world. "I bring that to the culture of urban planning now, which tends to be more, well, let's call it realistic," he laughs. But is there some value in talking about ideas as big as his? Is it possible that New York has a dearth of big plans—specifically because the mistakes made by the OG big thinker, Robert Moses? "It's something that's been missing from New York since the late career excesses of Robert Moses put an end to large-scale planning and development," said one commenter on the NYT. "It makes no sense to inhibit the brainstorming with conjecture about political feasibility," said another. The plan is expansive, and it's hard to deny its tidiness if not its realism. But New York, whether it likes it or not, is entering a phase in which expansive plans may figure prominently: After all, the Federal government is funding more than a half billion dollars in storm-proofing infrastructure in New York, including a massive berm that will ring Manhattan to slow storm surges. Venturi sees his plan as part of a push to build a more resilient city, though it will cost far more than half a billion dollars. "It's a very conservative plan, in the sense that anything else is reckless," he says, comparing the current plan to redesign LGA's terminals but not its runways or foundation to "rearranging the deck chairs on the Titanic." Instead, Venturi sees the rising sea levels and storms that have engulfed the airport before as evidence of the need to reassess the airport on a foundational level—literally. Of course, in the end, this is just one idea in a sea of socio-economic and political complexities. But Venturi and his team have already reached one major goal: We're thinking about the city in a way that we don't very often. In the end, that might be this project's most significant contribution. Lead image: Phillip Capper/CC. All maps courtesy of Rethink NYC and Sigmund Lerner.